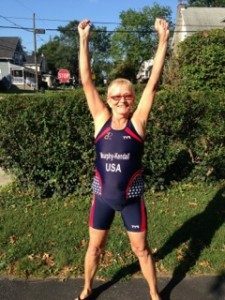 Kay, Tabas & Niknam Ophthalmology Associates is proud to boast the athletic accomplishments of long time patient Vicki Murphy-Kendall. Mrs Murphy-Kendall is a patient of Dr Tabas, and she is also an international triathlon superstar! 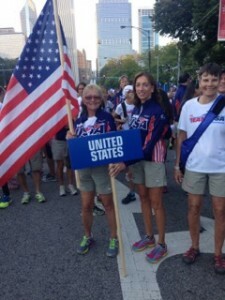 The USAT (United States of America Triathlon Association) has ranked Mrs Murphy-Kendall among those in her age group as 1st in PA, 5th in the Mid Atlantic Region, and 31st in the US!! At the national competition in Milwaukee, she placed 5th in her age group. At the international competition in Chicago on September 16, 2015 she placed 8th in her age group! She is currently training for a meet next month in New Orleans, and because of her accomplishments she is now qualified for the International Meet in Cozumel, Mexico in September 2016! We would like to mention that she is training for these events after recovering from recent cataract surgery on both eyes! Vicki Murphy-Kendall had cataracts and significant astigmatism. After a discussion with her surgeon, Dr Tabas, the decision was made to proceed with cataract surgery with toric lenses in both eyes and to aim for monovision. Toric lenses reduce the astigmatism, which can distort and blur vision. Monovision allows one eye to see near and the other to see far. So, she is no longer dependent on a high glasses prescription or contact lenses for near or far activities. Mrs Murphy-Kendall is very happy with her surgical result. Vicki Murphy-Kendall, our whole practice (and now many of our patients) are routing for you in Cozumel!! Thank you for allowing us to share your story with our patients!